This name uses Spanish naming customs: the first or paternal family name is Montoyo and the second or maternal family name is Díaz. Montoyo threw and batted right-handed. During his playing days, he stood 5 feet 10 inches (1.78 m) tall, weighing 170 pounds (77 kg). Montoyo appeared in four games for the Montreal Expos, during the 1993 season, as a second baseman and pinch hitter. After playing college baseball at Louisiana Tech University, Montoyo was drafted by the Milwaukee Brewers in the sixth round of the 1987 amateur draft, and then traded to Montreal on January 20, 1993. During his brief MLB career, that September, he singled in his first big-league at bat off Gary Wayne of the Colorado Rockies. All told, Montoyo had two hits in five at bats, with three runs batted in (RBI). Montoyo played in 1,028 minor league games and retired at the end of the 1996 season. In ten years in the minors, he batted .266, with 38 home runs, and 400 RBI. In 1997, Montoyo joined the Tampa Bay Devil Rays' organization — the year before the expansion team played its first Major League game — as manager of the Rookie-level Princeton Devil Rays. After leading Princeton to a 39–30 win-loss record in 1997, Montoyo managed the 1998 Short Season-A Hudson Valley Renegades, where he won his first division title. In 1999–2000, he managed the Charleston RiverDogs, leading them to their first winning season. He then was the pilot of the Bakersfield Blaze of the High Class A California League in 2001–2002. For the next four years, he served as the manager of Tampa Bay's Double-A clubs, the Orlando Rays (2003) and Montgomery Biscuits (2004–2006), where he won the Southern League championship in 2006. In 2007, Montoyo became manager of Tampa Bay's top farm team, the Durham Bulls. Under his leadership, Durham had only one losing season and exceeded 80 wins five times in his first seven years. In 2010, the Bulls set a franchise Triple-A record for wins with 92. In both 2009 and 2013, they won the Governors' Cup, emblematic of the championship of the International League. Through 2015, his career minor-league managing record was 1,341–1,211 (.525). Montoyo was a coach for the Puerto Rican 2009 World Baseball Classic team. Also, he was selected to serve as a coach for World Team in the 2010 and 2011 All-Star Futures Game. He won the 2009 Mike Coolbaugh Award and 2010 and 2013 International League Manager of the Year Award. 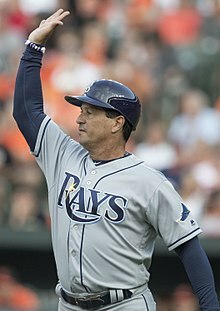 On July 21, 2014, Montoyo surpassed Bill Evers as the Bulls' all-time winningest manager with his 614th victory at the helm of the Rays' Triple-A affiliate. At the time his promotion to the Rays, Montoyo had notched 633 wins in a Bulls' uniform. On October 19, 2015, Montoyo interviewed for the Seattle Mariners vacant managerial position. On October 24, 2015, the Rays hired Matt Quatraro as their new third base coach and Montoyo became the bench coach, replacing Tom Foley. On October 25, 2018, Montoyo was hired as the manager of the Toronto Blue Jays for the 2019 season. He signed a three year contract, with a club option for a fourth year. As of game played on April 21, 2019. Montoyo and his wife, Samantha, have two children. ^ a b "Charlie Montoyo Managerial Record". baseball-reference.com. Sports Reference LLC. 2019. Retrieved April 21, 2019. ^ Topkin, Marc (December 19, 2014). "Rays add Charlie Montoyo, Rocco Baldelli to coaching staff". Tampa Bay Times. St. Petersburg, Florida. Retrieved December 20, 2014. ^ Rebilas, Mark (October 24, 2017). "Rays hire Quatraro as third base coach to replace Charlie Montoyo". Fox Sports Florida. St. Petersburg, Florida. ^ a b Chisholm, Gregor (October 25, 2018). "Blue Jays hire Rays coach Montoyo as skipper". MLB.com. Major League Baseball. Retrieved October 25, 2018. ^ "DURHAM'S JOHNSON NAMED 2010 IL MVP; HELLICKSON, FREEMAN, & MONTOYO ROUND OUT AWARD WINNERS" (PDF). MiLB.com (Press release). 2010-08-30. Retrieved 2010-08-31. ^ "A father's gift, a father's hope". espn.com. June 16, 2008. Retrieved October 25, 2018.